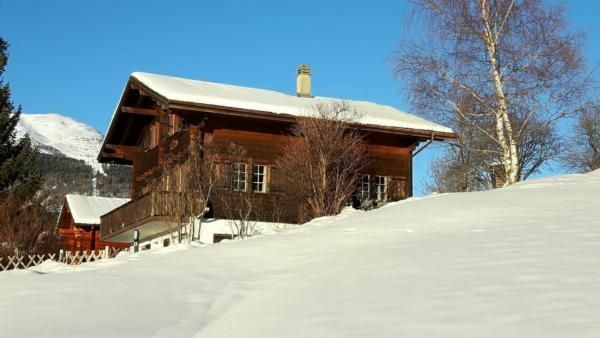 Fully furnished Swiss chalet apartment in charming Ernen (1200 meters above sea level). In the apartment on the ground floor there are 2 bedrooms with space for a total of 4 people. On request, you can rent the entire house with 4 additional bedrooms for a surcharge, suitable for a total of 12 people. The house has no direct access. The path from the car park leads over a staircase and a 60-meter long, slightly rising footpath to the chalet. In winter there is a short toboggan run right next to the front door. You can reach the nearby Aletsch area, Unesco World Natural Heritage, with a free sports bus from the Erner village square. Cross-country ski trails are reachable within a few minutes walk. In summer, the area turns into a hiking paradise in beautiful nature with unique wildlife. In 1979 Ernen received the Henry Louis Wacker Prize for the particularly beautiful, well-preserved village image. Ernen has been known for over 30 years as an international music village for classical music. Throughout the summer, classical concerts and other cultural events are constantly taking place. - Pet: once per pet Costs amounting to 18 EUR (Mandatory). - Visitor's tax: per person and day Costs amounting to 2.1 EUR (Mandatory). Tolle Lage, herrliche Landschaft! Einzig die Ausstattung könnte teilweise etwas vollständiger sein - besonders in der Küche. Aber sehr nette Gastgeber!